The limited-edition Doritos Rainbows chips will feature inspirational quotes on the outside of the bag. Doritos are now available in every color of the rainbow. The chip brand announced a new campaign, in partnership with the It Gets Better Project, that will feature rainbow-colored chips in celebration and support of the LGBT community. 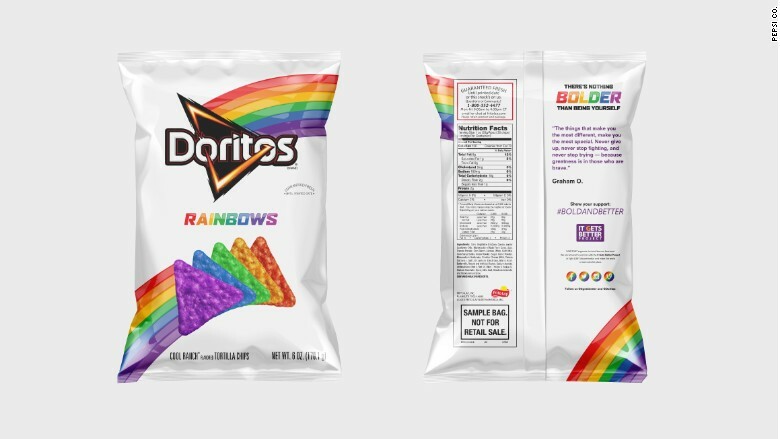 The "Doritos Rainbows" packages will only be available online for a limited time. In order to get a bag, customers must pledge $10 to the It Gets Better Project. The project, founded by author Dan Savage and his partner Terry Miller in 2010, was created in response to several LGBT teens who committed suicide. The organization's message is that "life indeed gets better," and the group aims to provide support and hope to LGBT youth worldwide. The chips are inspired by the Pride flag and the bags will feature inspiring quotes. Doritos said in a statement that the brightly-colored chips are the company's way of showing its support in the "boldest, most colorful way possible." Related: Toy set teaches kids about diversity. After making a purchase, customers can further demonstrate support by sharing messages over social media using the hashtag "#BoldandBetter." "Time and again, our consumers have shown us, there really is nothing bolder than being true to yourself and living life to the fullest," a Doritos spokesperson said in a statement. A spokesperson for the It Gets Better Project said it was honored to partner with Doritos and celebrate the progress the LGBT community has made in America. "By utilizing the incredible reach that Doritos has throughout the world, we can give hope to the LGBT young people who need it the most," a spokesperson for the It Gets Better Project said in a statement. "There is so much more work to be done, and together, we will inspire the LGBT community and its allies to continue the fight and embrace who they are by living a #BoldandBetter life." Brett Peters, the project's director of communications, also told CNNMoney that the chips are selling quickly and would only be available until October 11, which is National Coming Out Day. Peters said Doritos initiated the campaign and noted that 100% of the proceeds will go toward the It Gets Better Project. The chips will also be available on September 20 during Dallas Pride, which Doritos is sponsoring this year.